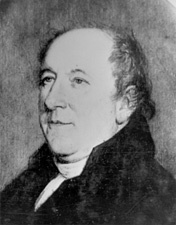 KING, Rufus, (half brother of Cyrus King and father of John Alsop King and James Gore King), a Delegate from Massachusetts and a Senator from New York; born in Scarboro, Maine (then a district of Massachusetts), March 24, 1755; attended Dummer Academy, Byfield, Mass., and graduated from Harvard College in 1777; served in the Revolutionary War; studied law; admitted to the bar and commenced practice in Newburyport in 1780; delegate to the Massachusetts General Court 1783-1785; Member of the Continental Congress from Massachusetts 1784-1787; delegate to the Federal Constitutional Convention in Philadelphia in 1787 and one of the signers of the Constitution; delegate to the State convention in 1788 which ratified the Constitution; moved to New York City in 1788; member, New York assembly; elected to the United States Senate in 1789; reelected in 1795 and served from July 16, 1789, until May 1796, when he resigned to become United States Minister to Great Britain; Minister to Great Britain 1796-1803; unsuccessful Federalist candidate for Vice President of the United States in 1804; again elected as a Federalist to the United States Senate in 1813; reelected in 1819 and served from March 4, 1813, to March 3, 1825; chairman, Committee on Roads and Canals (Sixteenth Congress), Committee on Foreign Relations (Seventeenth Congress); unsuccessful candidate for Governor of New York in 1816 and for President of the United States in 1816; again United States Minister to Great Britain 1825-1826; died in Jamaica, Long Island, N.Y., April 29, 1827; interment in the churchyard of Grace Church. Papers: In Walker family papers, 1798-1833. Papers: In Richard Dale papers, 1780-1845. Papers: In King family papers, 1796-1803. 51 items on international politics and diplomacy, Franco-American relations, and arms purchases. Finding aid. Papers: 1784-1787. 19 items. Letters to Dr. Daniel Kilham concerning personal affairs and matters of contemporary diplomacy and politics including peace treaty with England, the Barbary powers, Spanish remonstrance against U.S. navigation of the Mississippi, and Mr. Adams' reception at British court. Additional Papers: In Cyrus King papers, [ca.1791]-1817; and John Jay papers, 1668-[ca.1862] (permission to use certain items required). Papers: 98 items (1782-1822) in various collections, chiefly correspondence with Oliver Wolcott, Jr. Finding aid. Papers: Portrait in Washington Irving's Life of George Washington, Volume XIV, Miscellany, 1784-1860; and correspondence in John Quincy Adams papers, 1796-1848 (bulk 1820-1848). Papers: 1 item (September 20, 1789) in Thompson's collection. Papers: 10 letters (1785-1787) from King to John Lowell in Lowell family papers, 1640-1894. Finding aid. Papers: 1782-1830. 599 items. Diplomatic correspondence during his ministry at the Court of St. James. Finding aid. Papers: In Joel Roberts Poinsett papers, 1785-1851. Papers: In DeBois family papers, [ca. 1716-1927]. Papers: 1815-1863. 94 items. Letters to and from King. After 1827, letters are primarily those of his widow written to her mother. Papers: 1784-1822. 30 items. Also correspondence in Alexander Hamilton papers, 1708-1963, and United States Constitution papers, 1787-1944. Papers: Ca. 160 items (1782-1825) in various collections. Papers: 3 letters and portraits. Papers: 1 item (February 8, 1791) in Department of State records. Papers: Correspondence in Stevens family papers, 1663-1959. Papers: 1783-1825. 11 volumes. Letters, notes, accounts and miscellaneous items from his political and diplomatic career. Also correspondence, papers, and genealogical material in King family papers, 1754-1908. Ca. 650 items. Papers: In Goodhue family papers, [ca. 1622-1895] (bulk 1770-1850); and Bowne family papers, 1794-[ca. 1933] (bulk 1794-1851). Papers: 1786-1823. 8 items. 7 letters and a broadside (no date) of committee report to Congress concerning the Treasury. Also in Alexander Hamilton papers, 1760-1830, on 46 microfilm reels of originals at Library of Congress. Papers: In Ostrom family papers, 1809-1843. Papers: In Samuel Holten papers, 1769-1816; and Society for Propagating the Gospel among the Indians and Others in North America records, 1791-1875. Papers: 1787-1826. 70 items. 49 were written to his son, Frederic Gore King. Papers: 1793-1823. 9 items. Includes letters from King to different individuals and a published engraving. Papers: Correspondence in Peter Van Gaasbeek papers, 1773-1802. Papers: In Timothy Pickering letters to George Washington, 1798-1799; and 1 letter (May 2, 1801) from John Quincy Adams. Papers: 1 letter in Simeon DeWitt collection, 1778-1834. Papers: 1 item (no date) in Hull collection of letters regarding the Adams family. Papers: 1809. 1 letter. Concerns a turnpike from Brooklyn to Flatbush and Jamaica. Papers: 1 item (June 26, 1790) in Strong papers. Papers: July 3, 1798. 1 item. Note to William V. Murray, American minister in The Hague. Papers: Correspondence in Ira Allen papers, 1730-1861. Finding aid. Papers: In Humphreys-Marvin-Olmstead collection, 1776-1867; and David Daggett papers, 1781-1851. Arbena, Joseph L. "Politics or Principle? Rufus King and the Opposition to Slavery, 1785-1825." Essex Institute Historical Collections 101 (January 1965): 56-77. Brush, Edward Hale. Rufus King and His Times. New York: N.L. Brown, 1926. Egerton, Cecil Baker. "Rufus King and the Missouri Question: A Study in Political Mythology." Ph.D. dissertation, Claremont Graduate School, 1968. Ernst, Robert. Rufus King, American Federalist. Chapel Hill: University of North Carolina Press, 1968. ___. "Rufus King, Slavery, and the Missouri Crisis." New-York Historical Society Quarterly 46 (October 1962): 357-82. Hockett, Homer C. "Rufus King and the Missouri Compromise." Missouri Historical Review 2 (April 1908): 211-20. King, Charles R., ed. The Life and Correspondence of Rufus King. 6 vols. 1894-1900. Reprint. New York: Da Capo Press, 1971. Reeser, Robert E. "Rufus King and the Federalist Party." Ph.D. dissertation, University of California, Los Angeles, 1948. Welch, Richard E., Jr. "Rufus King of Newburyport: The Formative Years (1767-1788)." Essex Institute Historical Collections 96 (October 1960): 241-76.